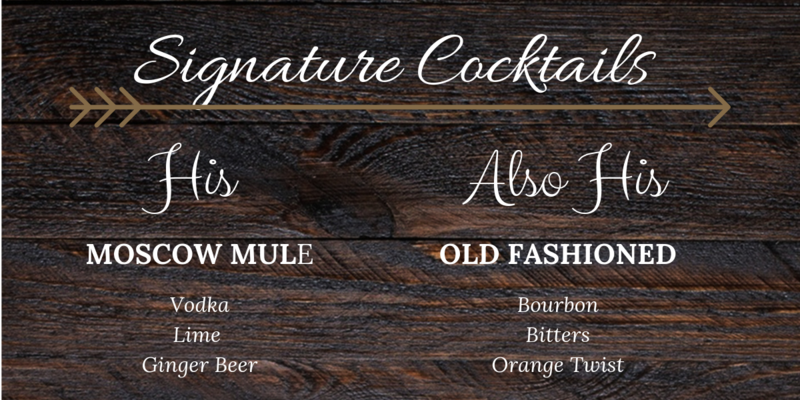 Trying to decide what “signature cocktails” to offer for a wedding or event? Signature cocktails are a fun and creative way to personalize your bar menu – and picking them should be too! 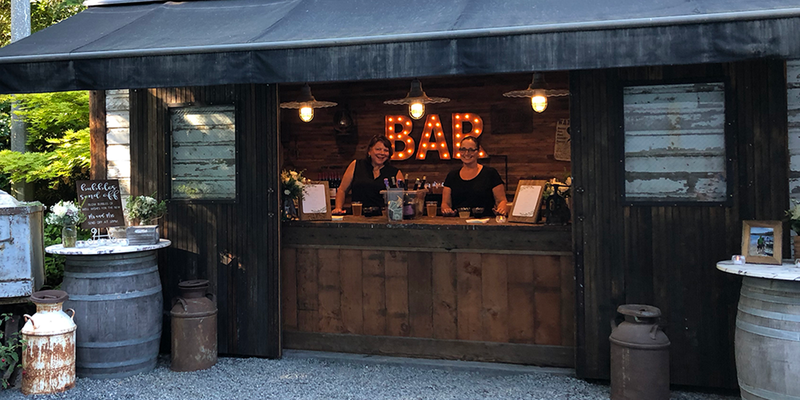 In our recent post on how to plan your perfect bar menu, we broke down the amount, type, and variety of beverages to serve at any event. Today we are taking it one step further to talk about how to pick your signature cocktails. Hint: simplicity is key! Here are our top no-stress tips for picking signature cocktails that you, and your guests, will love. We suggest having one, or a maximum of two, signature cocktails at an event. The more options you give, the longer it takes your guests to choose and move through the bar line. You should spend your time drinking signature cocktails, not waiting in line for them! If your wedding or event has a theme, incorporate it into the bar! We often pair specialty cocktails based on food, such as mojitos or margaritas with Mexican food, or a Negroni with Italian. You can also pick based on your colors! If you can’t decide on just one, this is a great option for couples! Base it on each person’s favorite drink, or, just pick something that you’ll enjoy. A special way to memorialize someone who can’t attend your event is to serve their favorite cocktail. Your guests will love sharing in that special memory with you. Signature cocktails do not need to perfectly sum up your past and future relationship in a glass – that’s a lot of pressure for one cocktail. If you DO have a drink that is meaningful to you – use it! But if not, don’t stress. Above all, signature cocktails are a fun way to share a beverage with your guests. The most important criteria, of any beverage, is that it’s delicious! Our clients often get concerned that their guests won’t like the cocktails they pick. To that we say, don’t worry about it! As long as you are providing another option like a wine or beer, your guests will be more than taken care of. Think of specialty drinks as another fun way to include your family and friends in things that you really like. If you don’t know where to start, first pick a type of alcohol that you normally drink. This will help you narrow in on the types of drinks that you will probably enjoy. If you are offering two cocktails, we suggest having one clear spirit and one brown spirit. Whiskey and Vodka are the two spirits we work with the most! Make your drink feel extra special with some personalization. Instead of a vodka soda, rename it! 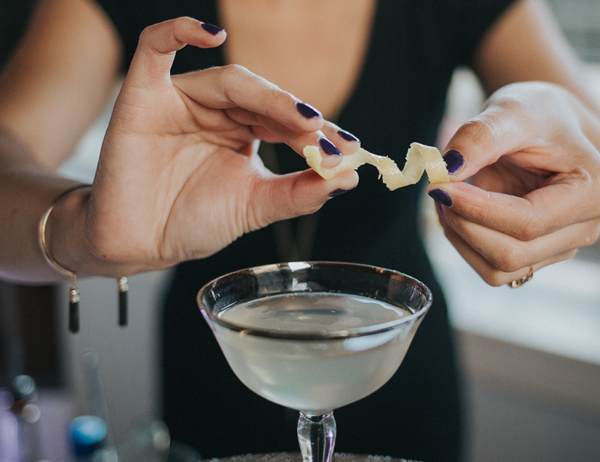 Our number one tip is to sample cocktail options before you commit. Go out to your favorite bar and try out a few that you are interested in. This saves you from buying all of the ingredients that you may or may not use again, and it’s the perfect date night! You can also go on Pinterest, Etsy, or Instagram for inspiration … there are so many great options to chose from! Still having trouble deciding? Ask your bartending service for recommendations. Here is a short list of some of our favorite tried-and-true specialty cocktails. You can’t go wrong with one of these! What are your favorite specialty cocktails? Leave a comment or tag us @partyontherocksseattle to let us know! Last summer, we started thinking more about our practices and the ways that we, as a company, are having an impact on the environment. We know that there is a great deal of waste generated in the food and beverage industry, and in large events especially. To help reduce our impact we started with what we know the best – the bar! 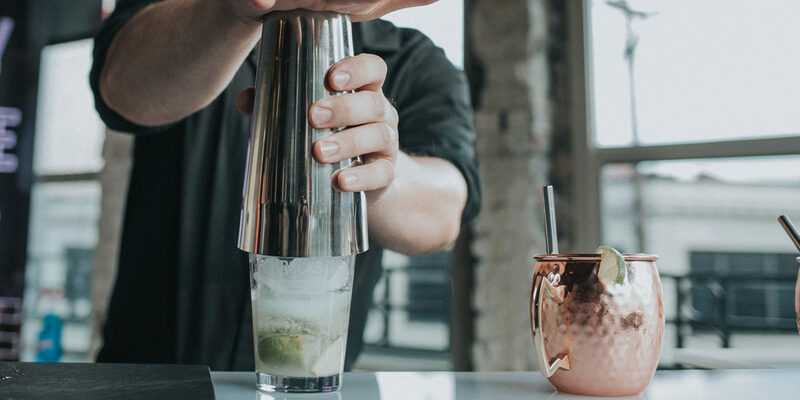 Here are a few of the things we changed in our own practices, including tips for how you can green up your bar service. The first step was eliminating or reducing as much single-use plastic as we could from the bar. The best way to do this is to incorporate reusable glassware whenever possible. 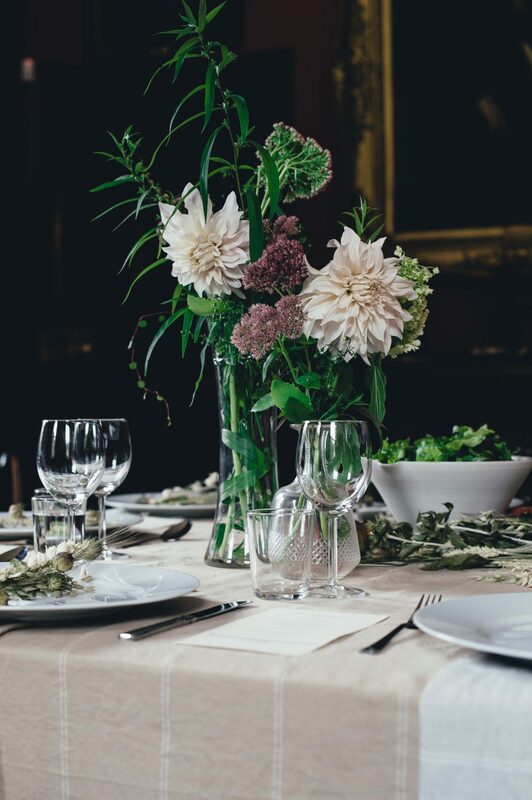 However, we also recognized that availability for glass was dependent on the venue and sometimes the caterer. Our second-best option was to switch to compostable glasses. Compostable glasses typically break down in 90 days or so, compared to hundreds of years for plastic. No brainer! According to an article by Kate Bratskeir, in the US alone, over 500 million straws are used every day. Another simple way to reduce waste is to get rid of straws. There are new fantastic stainless steel reusable straws for personal use, but that doesn’t necessarily work in an event setting. In most of our cocktails, we simply use our stir spoon and present a ready to drink cocktail! Eliminating plastic water bottles from the bar is another great way to reduce waste. All you need is a dispensable water container and the same reusable or compostable glasses that you are serving cocktails in. If your caterer doesn’t provide these, we can! This also provides the opportunity for your guests who don’t drink to have a yummy fruit/herb infused beverage. Just ask us if you want some fun recommendations! At the end of the night when it’s time to pick up, the bar is when all of our green practices come together. It’s been great to see so many new venues and catering companies starting to provide composting service. We make sure that all waste is segregated at any venue that offers this service. There are a lot of ways you can set up the bar for your wedding or event. If you haven’t hosted large events before, it can seem overwhelming to decide! How much alcohol will you need? Should you serve only beer and wine, or spirits too? What about signature cocktails? Getting the right balance of the type of alcohol and the amount of alcohol is key. 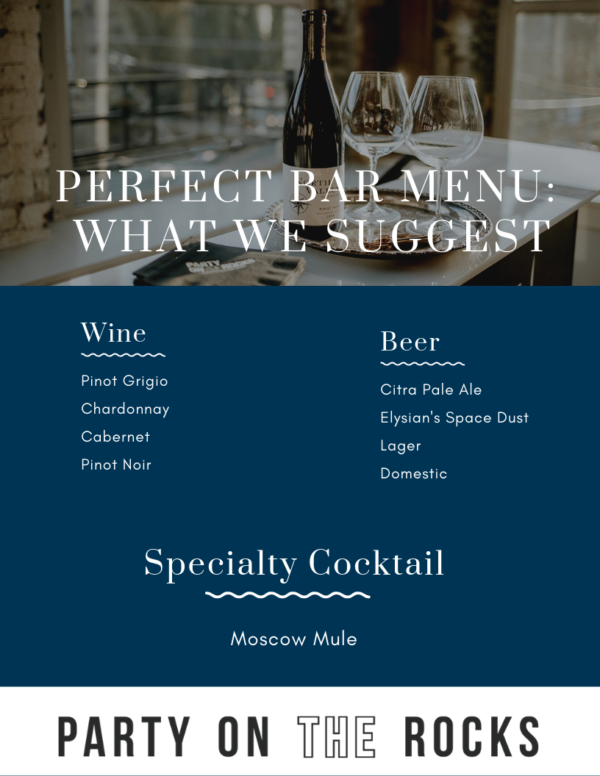 To help you plan your perfect bar menu, we’ve put together the most common questions we get asked by our clients, along with some of the biggest do’s and don’ts that we’ve seen. Question #1 – How much alcohol do I need? This is hands down the most common question we get asked. You don’t want to run out, and you also don’t want to end up with cases of wine leftover. To ensure our clients have just the right amount and stay within their budget, we use a simple guest to alcohol ratio. First, take the number of guests at the event, and multiply by the number of hours of bar service. You will do this for up to a maximum of 4 hours. 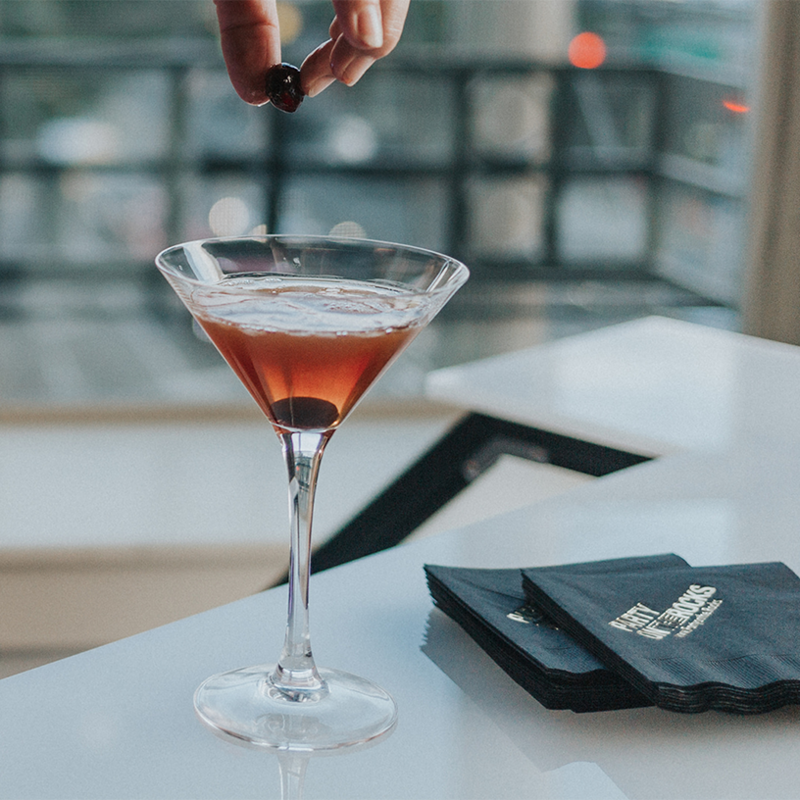 Our rule of thumb is to plan for no more than 4 drinks per person during an evening. This helps to ensure everyone is safe and responsible, and that you have the right amount of alcohol. Let’s take a 100-person wedding as an example that has a total of 6 hours of bar service. Even though the bar is open for 6 hours, we will multiply our number of drinks by 4. In this case, you would need 400 drinks. Then, depending on the type of drinks you will be serving, we can determine the exact amount to purchase. Question #2: What type of alcohol to serve? This is a big one, and there are a lot of options to consider! We have a few common ratios to help guide you, but the most important thing to take into consideration is your guests. You know them the best – are they strictly beer drinkers? Or will they have an occasional cocktail? This can help you decide whether to offer simply a beer and wine selection or to add in spirits, and the relative amounts of each. 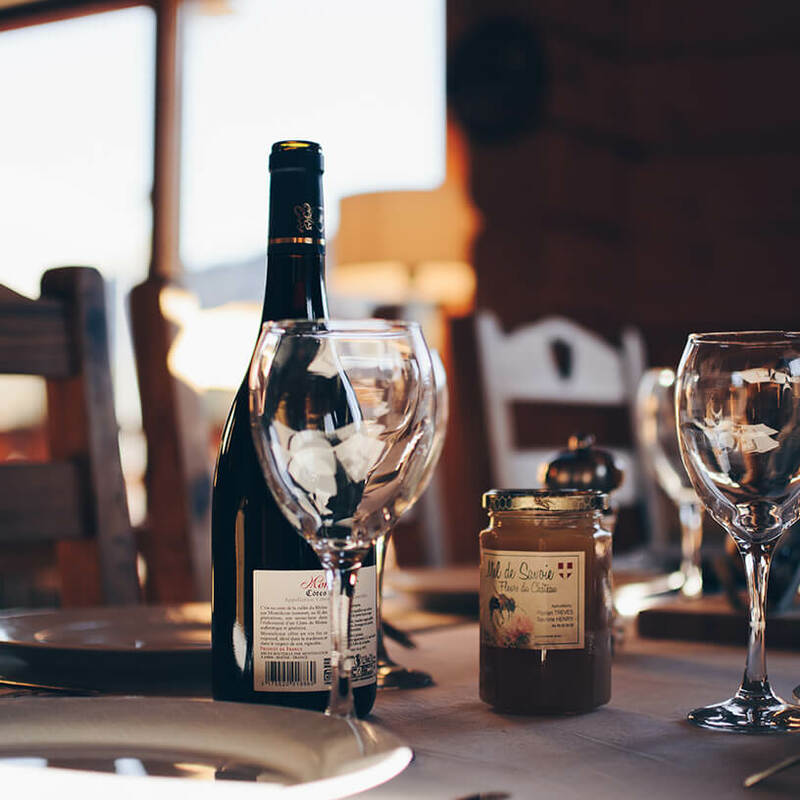 If you aren’t sure of your guests’ preferences, here are a few common ratios: For beer and wine, we suggest 60% wine and 40% beer. If you will also be serving spirits, we suggest 30% spirits, 30% beer, and 40% wine. Question #3: How much variety? A lof our clients worry about offering a wide-enough variety for their guests and “having something for everyone”. While it’s important to offer a mix of options, offering too many is one of the biggest mistakes you can make! The goal is to offer a selected group of alcohol that your guests can enjoy. Too many options will only end up backfiring. Imagine that you open your fridge and you have 20 different types of beer, 10 varietals of wine, and the makings for 8 cocktails. How will you ever choose?? You will be standing there all night making up your mind! That’s exactly how option-overload can feel for your guests. This can lead to long bar lines, frustrated guests, and a frazzled bartender. To avoid this common mistake, follow these guidelines to determine the variety within each alcohol type. Offer at least a white and a red wine, and perhaps a rose. Then, provide a maximum of two different types of each. For bottles and cans: provide no more than four types of beer. Another important note is that serving beer in kegs takes four times as long as bottles or cans. If you really want to keep your bar line moving, you may want to stick with bottles and cans. If you are going to include spirits on the menu, simplicity is key. We suggest a maximum of two cocktail options. This will help your guests avoid decision stress, and allow the bartender to efficiently serve your entire event. Question #4: What type of cocktails to serve? Specialty drinks can be a lot of fun, and there are so many directions you can go in! As with the rest of your bar menu, having a couple of select options for your guests is more than enough. Batch drinks that are non-carbonated are a great option because they can be prepped in advance. Some of our favorites are margaritas, Moscow Mules, and mixed drinks such as whiskey and coke. Keep it simple! Question #5: How many bartenders do you need? The number of bartenders needed will increase with your number of guests and the complexity of your bar menu. One bartender can effectively serve about 100 guests if you are only serving beer and wine. As your guest list grows to over 100, think about adding a second bartender. If you are also serving spirits, you will want a second bartender if you have more than 75 guests. As bartenders, our number one goal is to make sure your guests have a fun, safe, and enjoyable experience! Keeping your bar menu simple is the number one piece of advice that we hope you follow. For more ideas, check out our sample bar menu below. What would you include on your perfect bar menu? Let us know! Every meeting planner knows how helpful it is to have an extra set of hands. When you’re managing multiple vendors, setting up the space, tracking down speakers, and keeping track of a hundred other details – having people to step in and get things done is huge. 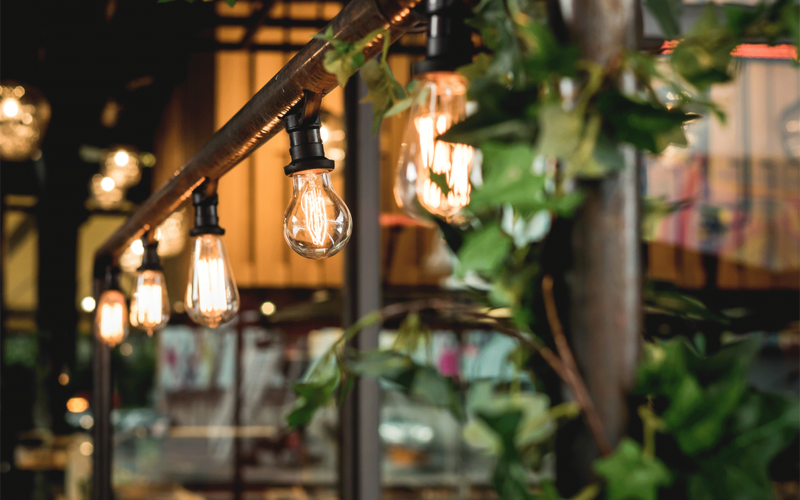 Whether you’re a small business with a single person in charge of planning events or a large company with a full events team, hiring event staff for day-of support can be the difference between a relaxed and a chaotic event. We’ve gathered the top three reasons to consider hiring event staff to help your corporate event run smoothly. 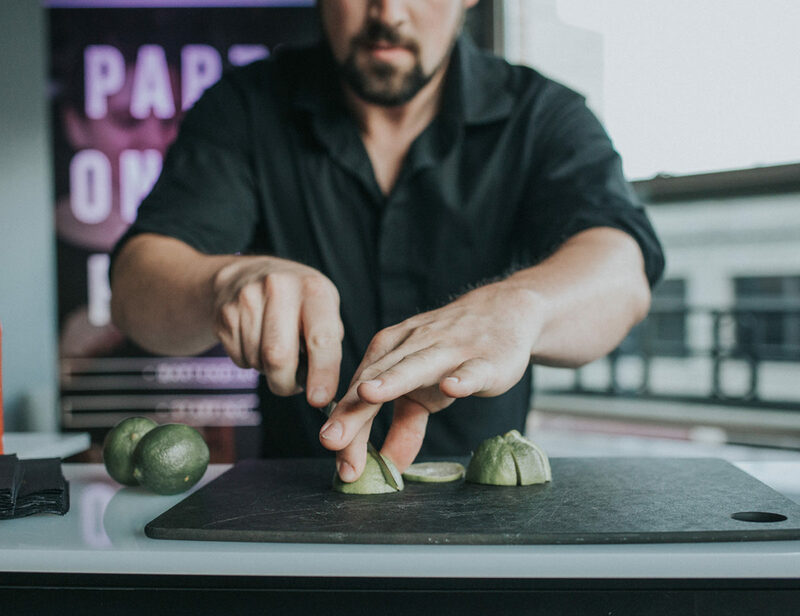 Event staff are experts at managing details, have a wide-range of skills, and are multitasking aficionados. That means they can jump in whenever and wherever you need them – from setting up the space, helping the caterers distribute food, doing dishes, and even taking out the trash. They are your extra set of hands (and eyes) and help make sure all the details are taken care of. Have you ever wished you could be in multiple places at once? Especially when the caterer needs someone to set place settings and fill water glasses, the photographer needs a run through on timing, and the chairs and tables were delivered, but no one has set them up? Event staff to the rescue. They can be the “glue” that holds your event together by working with all your other vendors, leaving you to manage the big picture. The bar is usually the hot spot of an event. 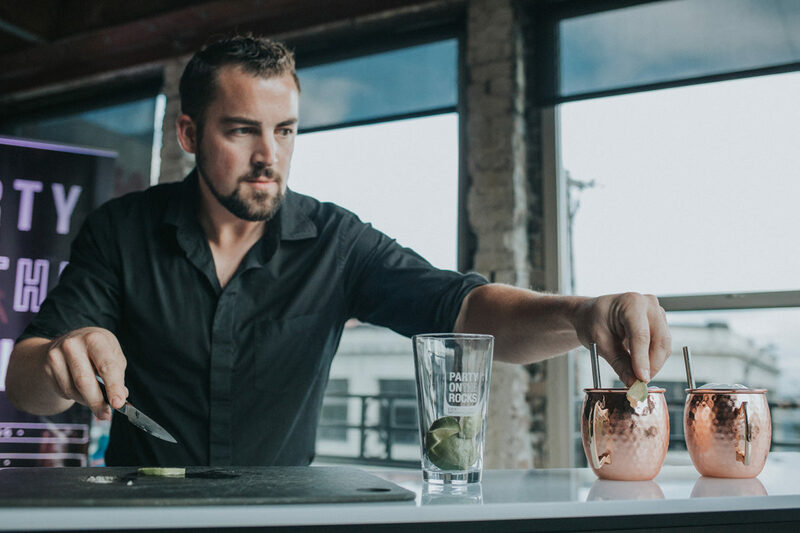 Hiring a bartending service will keep your event professional and running smoothly. Make sure your bartender is licensed and insured. 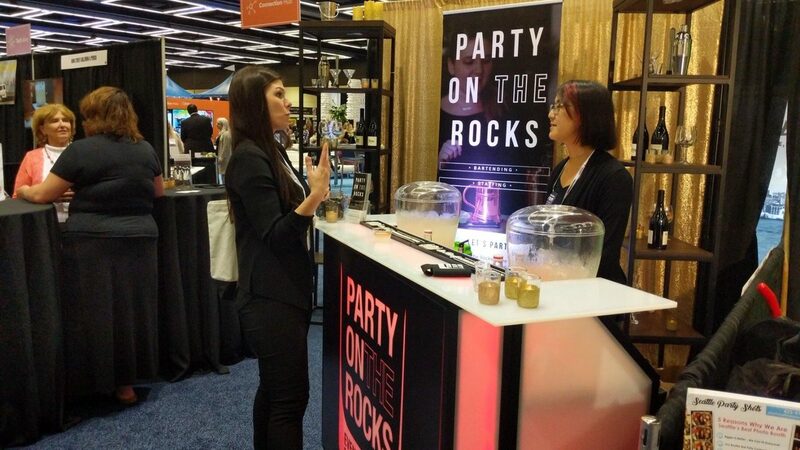 Hiring a bartending service with a liquor license, like Party on the Rocks, means they can also provide the alcohol for your event. This means one less detail for you to worry about. 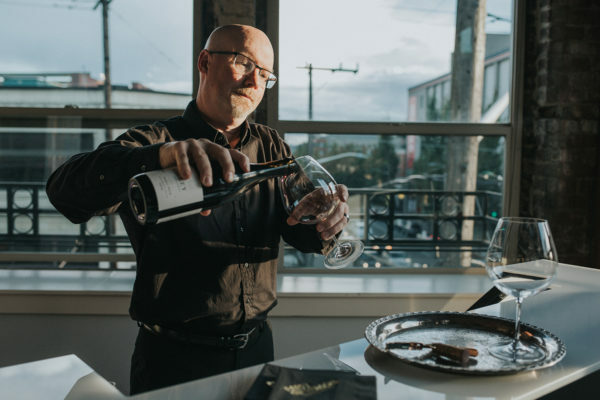 At the Northwest Events Show this fall we met over 2,500 of the top meeting and event professionals in the Pacific Northwest, with services especially designed for corporate settings. Take advantage of these great resources to help your next corporate event go off without a hitch!